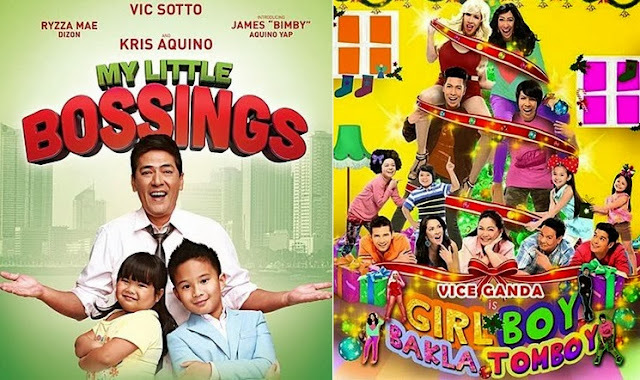 Manila, Philippines - The Metro Manila Development Authority (MMDA) confirmed on Thursday, December 26 that comedy flicks 'My Little Bossings' and 'Girl Boy Bakla Tomboy' lead MMFF 2013 box-office records. Eight (8) entries on Christmas day rake a whopping P134 million enough to topple last year's opening-day gross. According to MMDA Chairman Francis Tolentino, the 2013 MMFF first-day gross is higher by 23% compared to last year. December 25 and 26 ticket sales are dominated by 'My Little Bossings' on no. 1 spot, followed by "Girl, Boy, Bakla, Tomboy," "Pagpag: Siyam na Buhay," and "Kimmy Dora: Ang Kiyemeng Prequel," on the third and fourth place respectively. Meanwhile, Kris Aquino on Thursday, expressed her gratitude for those who supported 'My Little Bossings' (MLB) comedy movie starring her son Bimby and child wonder Ryzza Mae Dizon. Kris said that the two kids now hold the box office record for highest opening day gross for a Filipino movie. MLB also stars Vic Sotto. Comedian Vice Ganda, the lead star on title roles of quadruplets of both genders and different sexual orientations on 'Girl Boy Bakla Tomboy' said he is very happy with the good feedback he got from viewers about his film. “Sobra kong blessed. 'Di ko alam kung anung nagawa ko para i-deserve tong pagpapalang to. Ang bait ng Diyos. I can't help being emotional right now,” Vice said on micro-blogging site Twitter. 'Girl Boy Bakla Tomboy' is a co-production between Star Cinema and Viva Films while 'My Little Bossings' was co-produced by four film companies including OctoArts Films, M-Zet Productions, APT Entertainment and Kris Aquino Productions. "Kimmy Dora: Ang Kiyemeng Prequel" which centers on feuding twins, played by award-winning actress Eugene Domingo, in the film series' third entry since 2009. The movie is a co-production between MJM Productions and Quantum Films. The other films in the 39th MMFF are the action films "10,000 Hours" and "Boy Golden: Shoot to Kill (The Arturo Porcuna Story)," the historical biopic "Pedro Calungsod: Batang Martir," and the dance musical "Kaleidoscope World" which got few numbers in the ticket sales. MMFF is an annual film festival of pure Filipino-produced movies that runs from December 25 (Christmas Day) until the first week of January. MMDA Chairman and composed of key members of the film industry supervise this event.